I have recently been fascinated with the historic Japanese textiles known as boro. Boro means, literally, “tatters.” These were made by repurposing carefully saved garment pieces and other handspun and indigo-dyed fabrics. 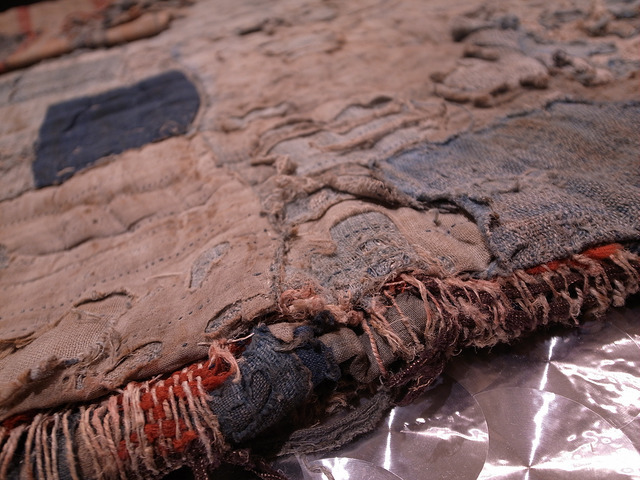 They were sewn together as a patchwork built up from many layers providing extra warmth. 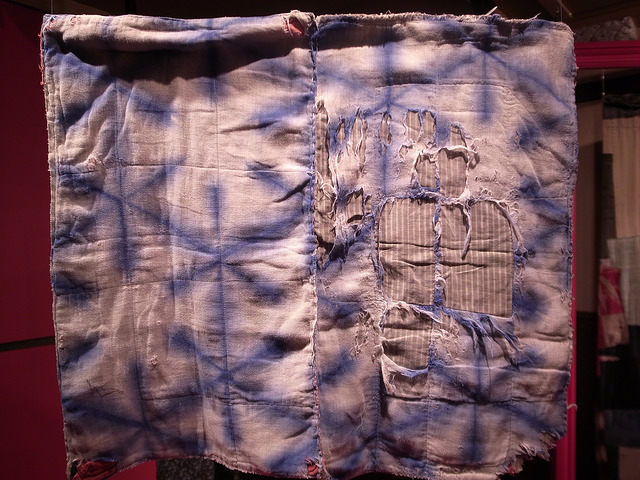 The example below was dyed using a simple shibori technique. 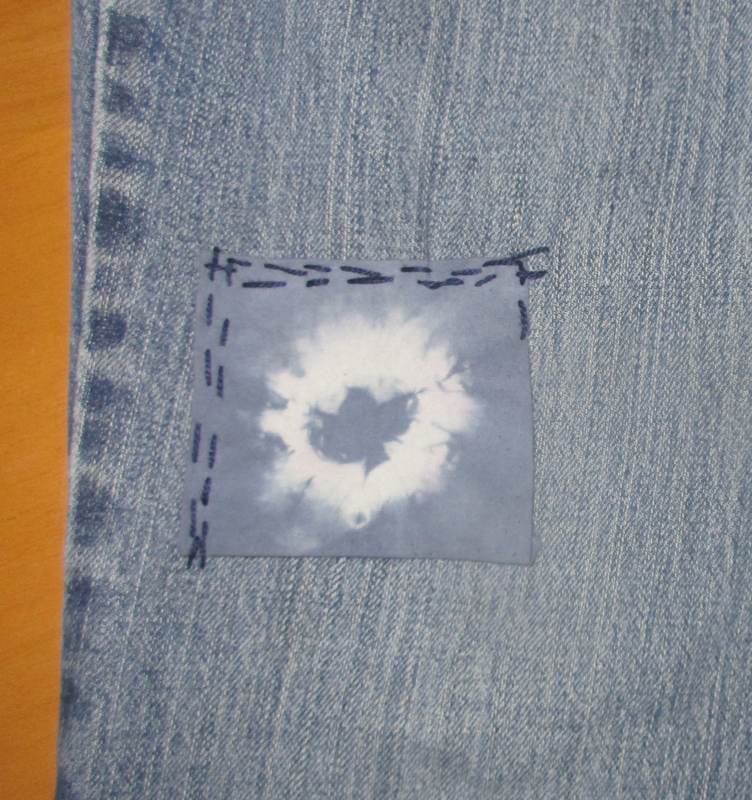 I showed several ways to do shibori dying here recently. If this example were still in use, it would have been patched with another fabric over the tattered right middle section. 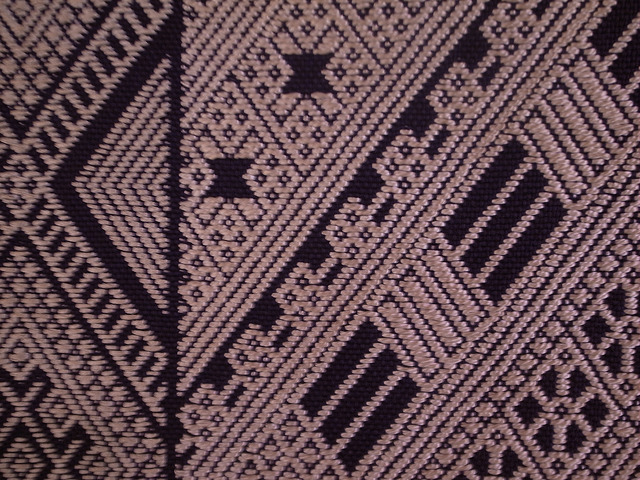 The Japanese used these unique textiles for utilitarian items such as futon covers, field clothing, sheets, and more. Including the interesting relics known as donja or yogi. 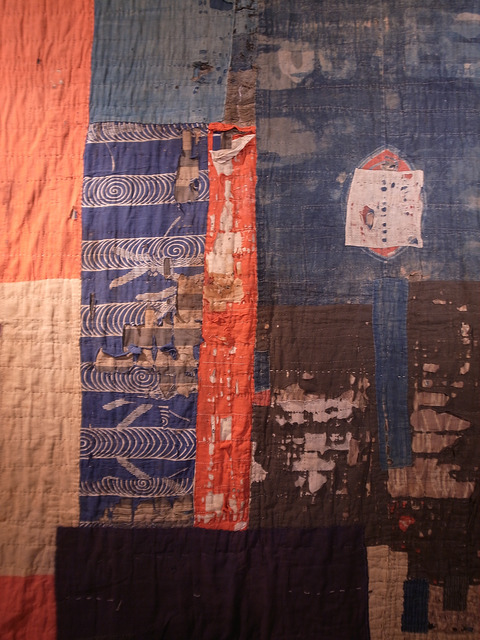 These curious boromono were quilts constructed in a kimono shape and worn by parents and children together while sleeping. Makers used careful patching and sometimes intricate stitching to craft these textiles, mending the same item many times over many generations. This accidental art form was born of necessity in Northern Japan. Peasants started making them during the Edo (1603-1868) period. Japan was closed to trade and under sumptuary laws at this time. These laws restricted clothing choices for the lower classes and forbade silk, bright colors, and large patterns. 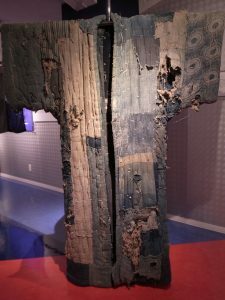 So peasants pieced and patched their indigo-dyed fabrics and saved every usable scrap of cotton for reuse in these boro items and garments. 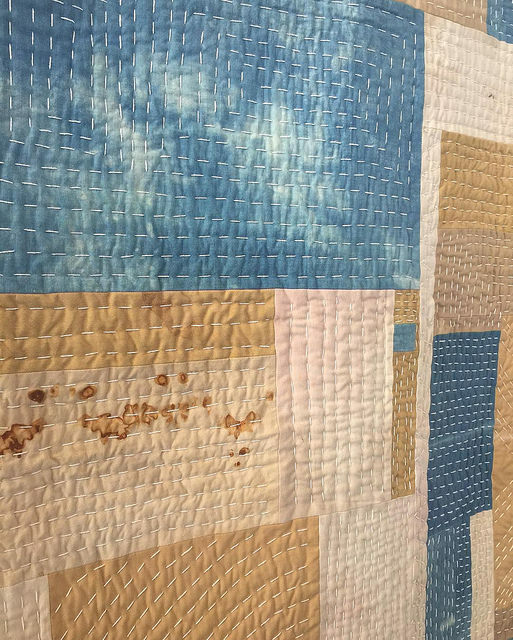 Since these pieces include fabrics saved and repaired over many generations, each piece is rich with family history and memories. 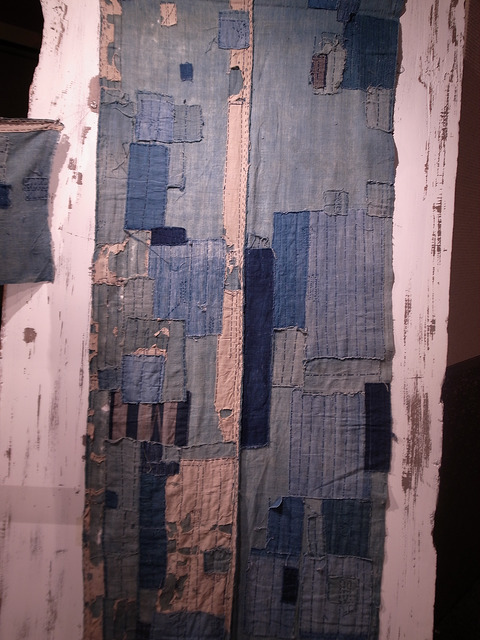 The homespun and indigo-dyed patchwork acquired a specific patina with age and antique boro cloths can be awe-inspiring when seen up close and in person today. This special and breathtaking beauty and historical significance takes several generations and a great many years to develop. So you could say that it is not possible to create new, authentic boro today- at least, not without also waiting about a hundred years! 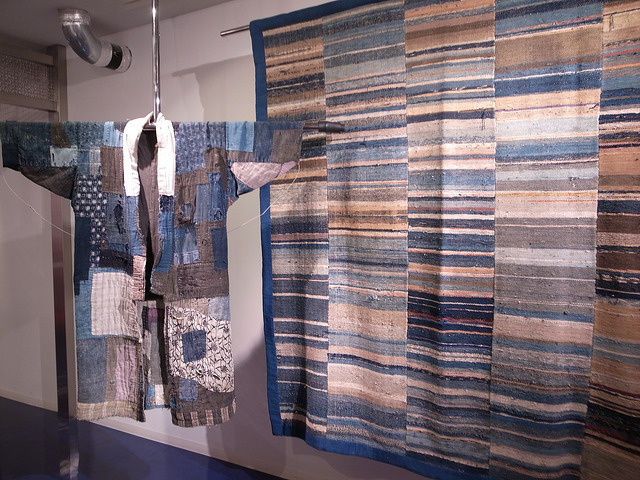 Japanese ladies began carefully piecing homespun and indigo-dyed natural fabrics together into boro during the Edo period using the distinctive and decorative stitches that later became known as sashiko. This art is still practiced today. 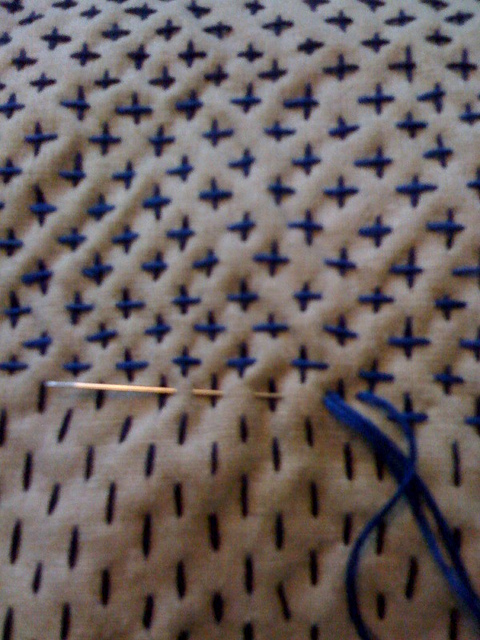 To work sashiko, you need a long needle and thick thread. You can order sashiko needles and sashiko thread from Japan, but if you don’t want to wait for long-distance shipping, you can make do with a long cotton darning needle. To substitute for sashiko thread, try perle cotton, which DMC makes in several thicknesses, both on spools and in skeins. 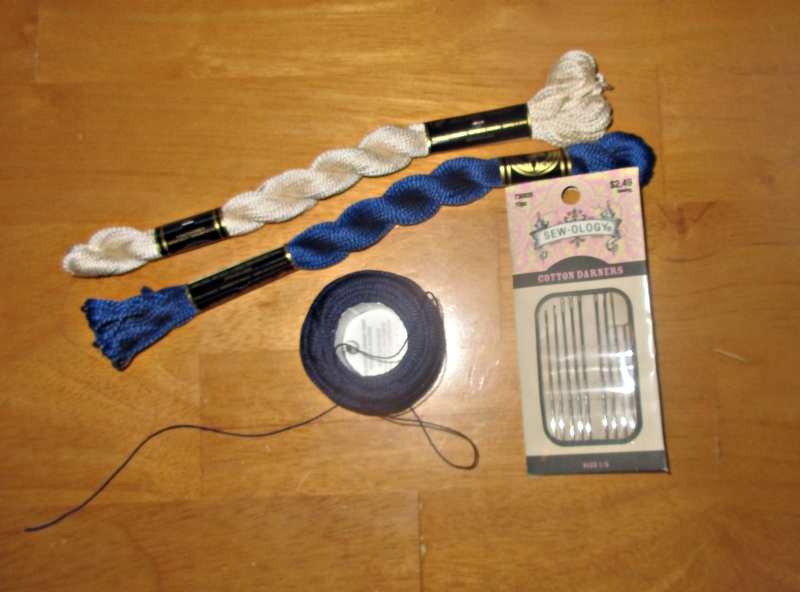 Or you can just use regular embroidery floss. 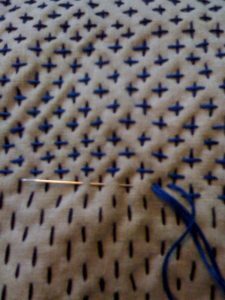 Sashiko stitching can be as simple as straight and long running stitches, or it can be challenging and complex. It can be sparse or dense. 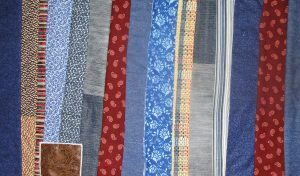 There are many traditional patterns to choose from. 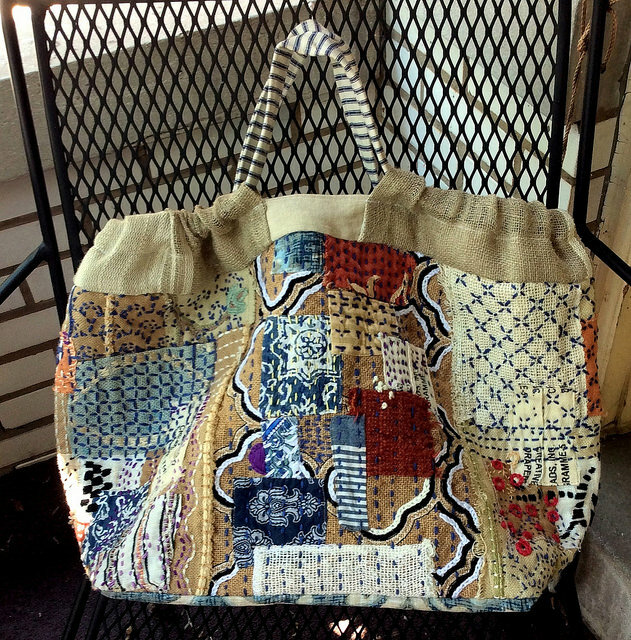 But sashiko allows individual creativity, and you can invent your own sashiko patterns, too. Here’s a tutorial from Sake Puppets to help you. This antique piece at the Amuse Museum in Tokyo is a wonderfully dense and detailed example of sashiko stitching. Boro jeans mending is currently popular right now, thanks in part to Ralph Lauren and other fashion designers who have featured several boro-inspired denim collections within the last decade. 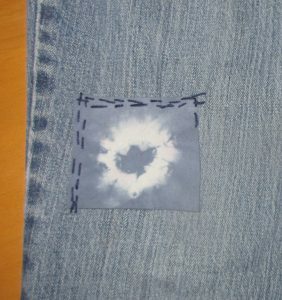 So if you have any torn jeans, you can use boro techniques to mend them into something more stylish. Here’s a nice tutorial that will help you to do this. Feel free to feature your boro patches on either the inside or outside of your jeans; they look interesting and stylish done either way. Also, don’t limit yourself to jeans; you can use boro mending to repair canvas shoes, a bag, jacket, hat, or any other item of clothing you choose. It’s not quite as easy as you’d think it would be. I’m not happy with these stitches at all and will rip them out and try again! 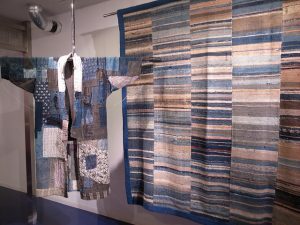 Yoshiko Wada, who popularized shibori in America, wrote an entire book about boro. I think that she would disagree with the notion that you can’t make new boro today. 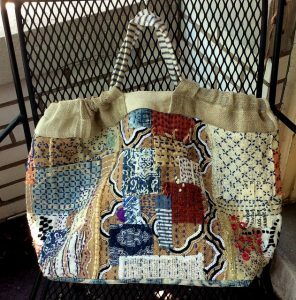 In any case, you can certainly make boro-inspired patchwork now. This modern day version of a boro quilt, photographed by GinaPina and made by Vessel Quilts, achieves an antiqued and authentic look through the use of rust and indigo dyes. 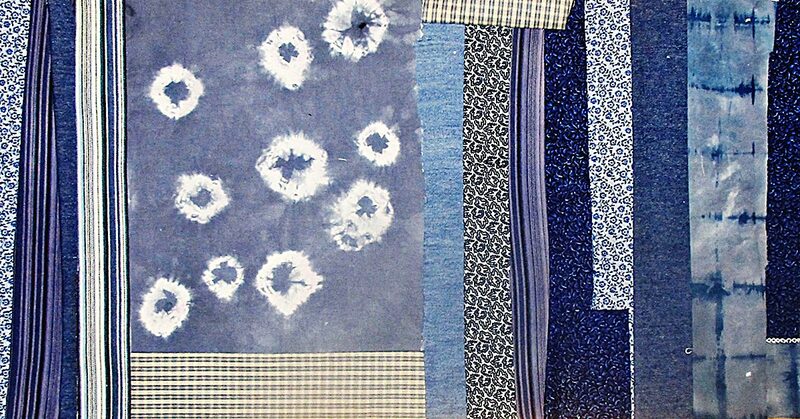 In making your own, you can choose to limit yourself to the authentic original palette of indigo-dyed natural fabrics. Or you can add in more neutrals, browns, blacks, or even a few reds for an extra pop of color. If hand stitching isn’t your thing, you can construct boro-inspired patchwork the same way you would make strip patchwork. 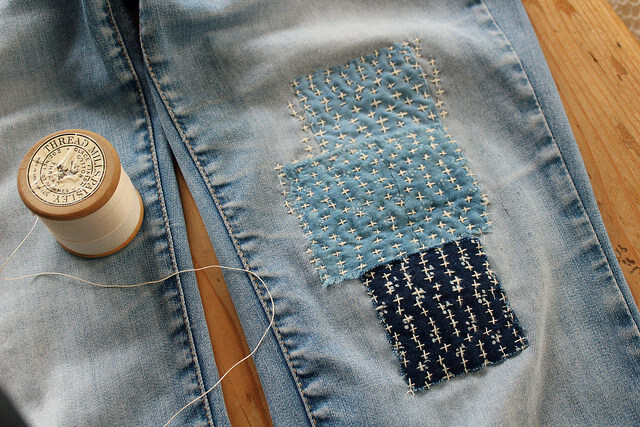 Then you can embellish with machine stitching over these seams, using a simple zigzag or a more decorative stitch. 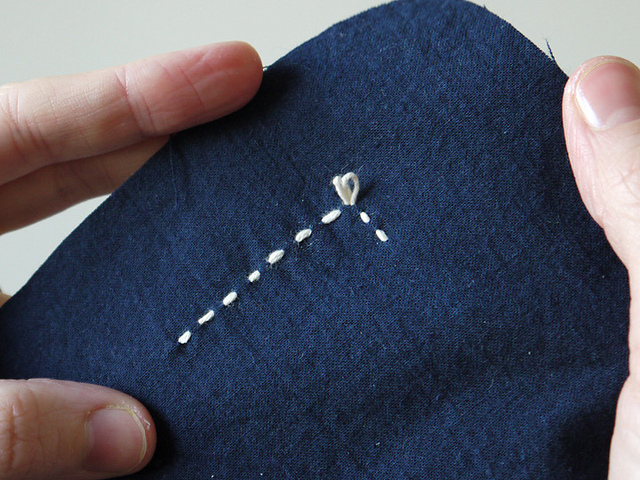 You could even get amazing and more authentic looking results if you invest in a Baby Lock Sashiko sewing machine. You could make a boro-inspired quilt, a pillow or cushion, or a small or large boro bag. You could echo boro’s traditional uses by making a futon cover or coat. 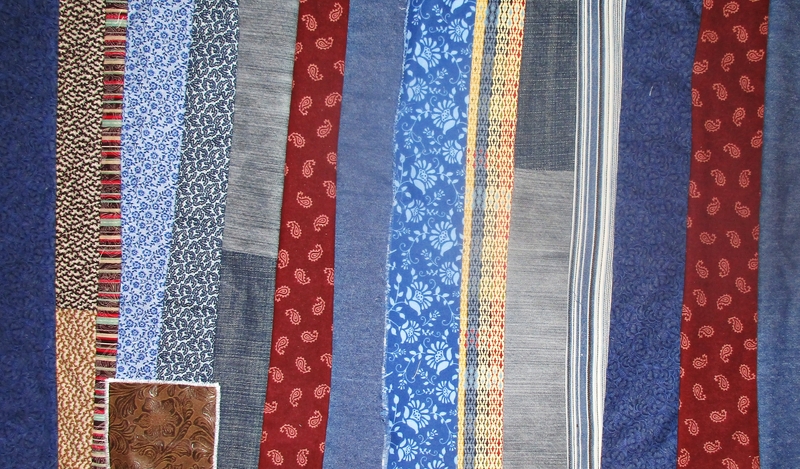 Or construct part of or an entire garment from your modern boro patchwork. Here’s my boro board on Pinterest, too, in case you’d like more info, inspiration, and ideas than I could fit into this post. 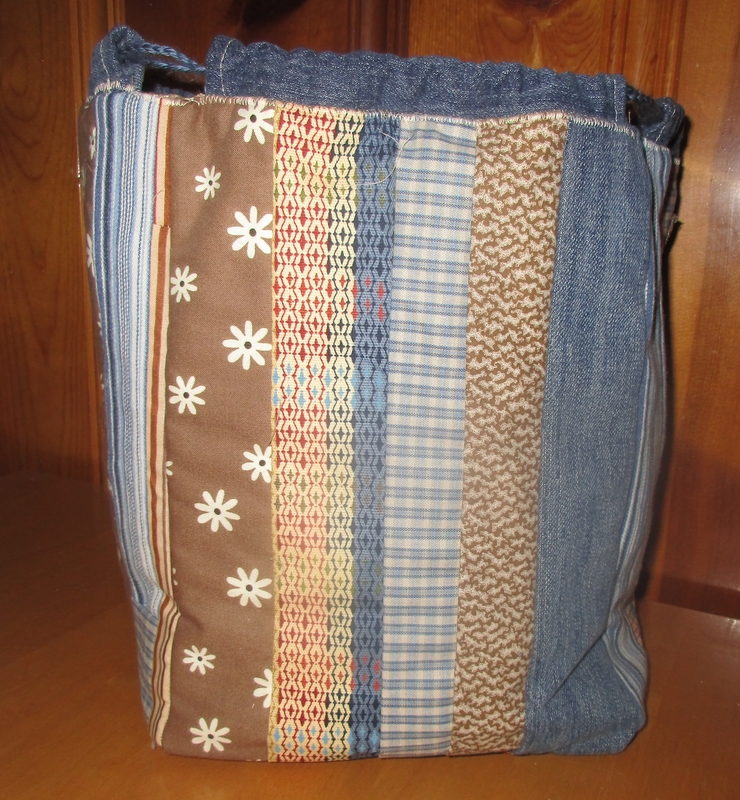 I made the pieces pictured above to sew a small kinchaku drawstring bag. I also think this kind of patchwork would look great as a bento, or azuma bukuro, bag. Both of these linked projects would be quick, useful, and satisfying ways to play with and use boro-inspired patchwork. I’ll show you what I’ll make from my other panels soon. In the meantime, if you are even half as intrigued by this textile art as I am, then I recommend that you experiment and play with it because it’s fun! Happy sewing! Thanks to na0905 for taking photos of the Boro exhibit at the amazing Amuse Museum in Tokyo, and for sharing these at Flickr with the lovely Creative Commons license. Thanks to GinaPina, Heather, and Jacque Davis for making their photos available this way, too.